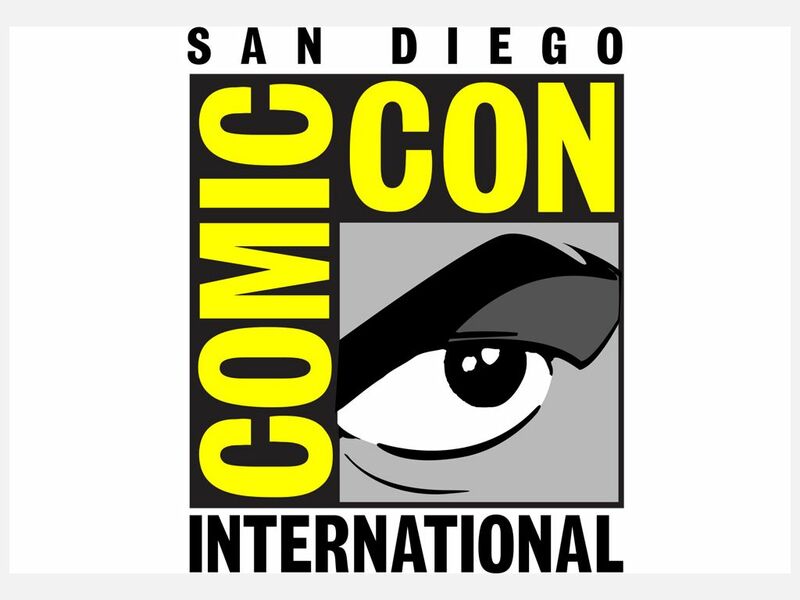 San Diego Comic Con (SDCC) is a trend setter, years ago it was a sacred recluse for geeks and nerds paying homage to the high and mighty of the comic world (not that there is anything wrong with that). It has changed a lot; it has evolved, gotten bigger, become fashionable. The major production houses now appear at Comic Con more than it could have ever been imagined a few years ago, but this is what life is about, evolution and adaptation. And when we talk about these two, Steampunk is a combination of both, an evolved adaptation of a passion to see the future if the pesky electronics had not meddled with the way we lived. Call me old-fashioned, but I like to hold things and get a real feel of them. Not some flimsy delicate object that feels violated if your touch is not as if you are holding a butterfly. The metal clunk, the moving gears; the beautiful artistry that is visible trumps the hidden electronic genius for me, any day, anywhere and anytime. For me Comic Con was refreshing, the steampunk panel was a group of highly intelligent people teamed together working in the same direction. As a steampunk romantic, who has feared for the future and direction, often, I can say it fairly safely; steampunk has started to pick up real steam now. There are many highlights about steampunk but what trumps all is the way steampunk looks to the eye, nothing against latex or anime but they are not my favorites. 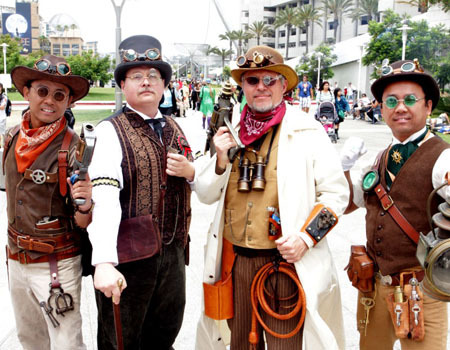 There is nothing more beautiful, elegant and unique then the steampunk costumes at comic con. Add the beautiful jewelry to the costume and behold, elegance personified. There has been steady development, form over function may be the case with modern jewelry and accessories but steam punk has somehow managed to keep these two much closer. Brass lockets that are both eye candy and double up as keys, watches that both tell time and are bracelets, elegant belts, amazing earrings, if you are a tragic for such things, this comic con was the place to be. The world has moved forward, probably for the better, sometimes though, it is great to look back from the window of imagination to see how the past would have changed our present. Comic con provides a beautiful glimpse to what it could have been; what sort of things would be fashionable? What sort of life would have been desirable? The dress code, everything. I do hope that things we love get more attention, the beauty that is not visible to the world now, deserves its day in the sunshine. 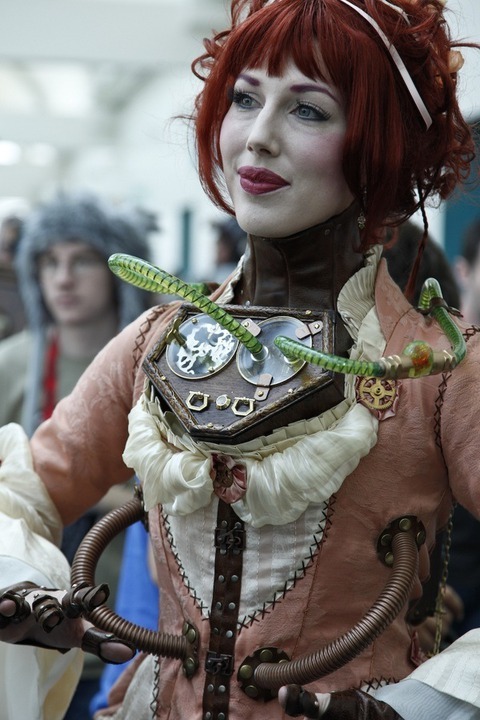 This entry was posted in Announcements, Steampunk Creations and tagged 2014, clockwork, clockwork fashion, clockwork jewelry, comic con, comic con san diego, inspired by elizabeth, steampunk, steampunk costumes, steampunk fashion, steampunk jewelry, steampunk necklace. Bookmark the permalink. I know what you mean, I can’t get enough of the handmade elegance of so many of the steampunk costumes and jewelry I see. I am going to Weekend at the Asylum, the biggest European steampunk con, in September and I can’t wait to see all the great cosplay.